Burning Rome is a game I’ve had a very difficult time contextualizing. It comes in this saturated blood-red box with the subtitle “Rome’s Nightmare”. The cards have attractive, but realistic depictions of Roman, Carthaginian, Celtic, and Gaelic soldiers on them. There are rules for creating your own decks, but there’s an entirely separate booklet included with set-ups to play through historical battles. The number of cards and the customization options suggest something more robust, but each game of Burning Rome takes only about 10 minutes. You look, and you see a game that wants to be bigger and more complicated than it is. 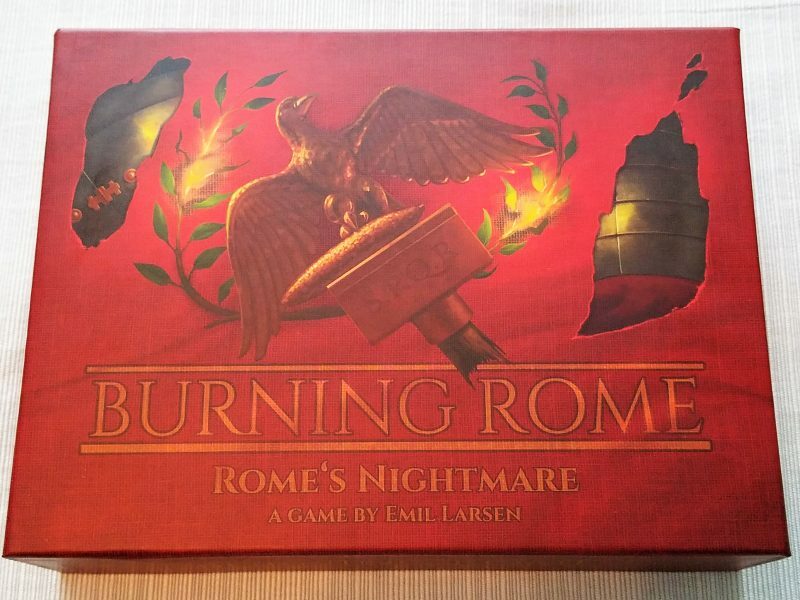 I shouldn’t be so baffled by Burning Rome, given that it’s been on my radar for months since I had a delightful conversation with its designer Emil Larsen. I know that it was originally intended to be the battle system for a much larger, more epic game, but Emil found that it worked on its own. I know that it’s supposed to be about positioning troops together effectively in different columns to maximize their strengths, and it sort of is. But after my first Burning Rome skirmish I was quite confused. Here’s how it played out: I assembled the suggested starter decks to create a Rome vs. Carthage matchup with some basic cards. I played Carthage and lucked into drawing both of my elephants and my general in my opening hand. This is significant because the elephants hit hard–VERY hard, but they cause extra costs in either command points (currency) or army strength (health) when you play them. However, when you play a unit in a column when your general, the general immediately hops on top of it so it’s always the card furthest back in the column, covering up whatever text is on the card your placing. In this case the additional costs for the elephants. My opponent could not generate enough damage to keep up with how much I was dealing, and they couldn’t effectively block much of what the elephants were doing. I won in like 3 turns. Why didn’t my opponent try to kill the elephants to remove them from the battlefield, you may ask. Well, Burning Rome doesn’t really have that as part of the game. There are some cards that will allow you to remove (or shift, which can be equally devastating), but they’re quite rare. Attacking someone else only removes their army strength and has no effect on the troops on the battlefield. The result, for most games, is much like my first: whoever can get the most attack points on the battlefield the quickest will win. This typically means that whoever gets the best starting hand will win. Most card games in this vein will have some sort of economy to manage–Magic has mana and Netrunner has credits. Command Points in Burning Rome should serve that purpose, and I suppose they do somewhat by virtue of simply being the currency for the game, but there’s no momentum to it. At the beginning of your turn you can either draw a card or gain two CP’s. Cards that let you accumulate either are few and far between and typically sacrifice one for the other–either you’re spending a card to gain CP’s or you’re spending CP’s to gain cards. There are a few units that will passively gain CP’s, but they seem relatively weak, and you need to keep them at the back of any of your columns to get the passive benefit. This can be done either by never placing another unit in that column or by waiting to play the economy unit until later in the game, which defeats the point of a passive econ gain. Thus games are over quickly and you almost always want to play units now rather than later because in the end the damage they’ll create will outweigh any kind of ancillary benefit you may gain by playing them at a different time. Because card and money gain is so slow, whatever gets played early tends to chip away at health slowly (or quickly, if you get those elephants out), before much else can develop. The plus side is that games are very quick–5 to 10 minutes at the most, but the sacrifice in any kind of middle or end game makes one wish for more. Perhaps I’m missing the point. In the box for Burning Rome you’re getting 216 cards for a game with a minimum deck size of 12. To compare, Netrunner, which has a minimum deck size of 45 (typically), has only a few more cards in its core set. 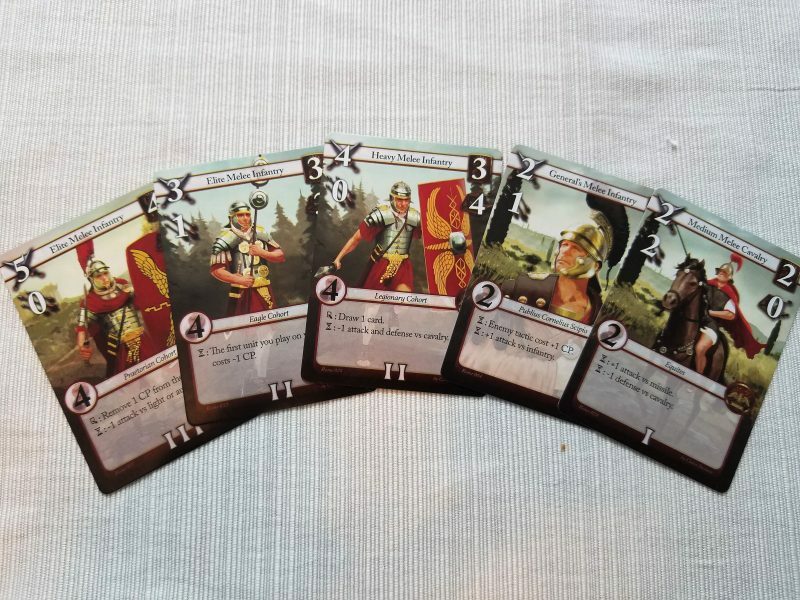 The amount of freedom you get with deck construction in Burning Rome is generous, and the rules for doing so are elegant and clever: you get 50 points to spend between your cards, AS, and CP. That’s it. Want to beef up your deck with all kinds of heavy duty units? You’re going to have to keep a lot of CP to play them, so your health will suffer. Trying to create a control deck that will disrupt enemy lines? You’ll want to save a lot of points for AS to wait out the long game. The most fun I had with Burning Rome was looking through the options available to me in one of the four included armies and trying to build the most potent combination of cards possible. 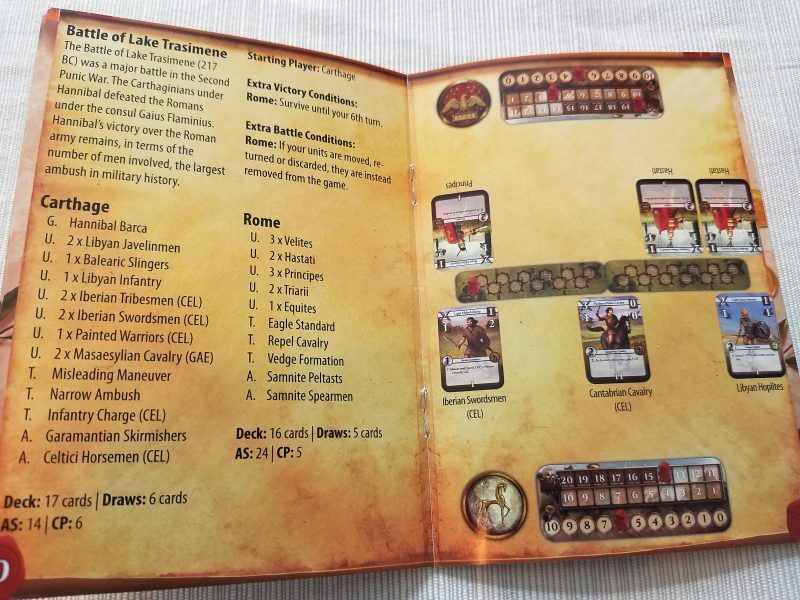 If you’re not so inclined to construct custom decks, the game comes with a booklet full of ancient battles and decks to simulate them. In addition, if you go to the Sun Tzu Games website you can find other decks created by Emil for people to try out. Unfortunately I don’t know how much I want to dig into that aspect of the game, as much as it might have potential. In order to want to theorycraft and discover hidden combos I need to be invested in the playing of the game itself, and nothing I’ve experienced makes me want to do that. Burning Rome doesn’t have enough tactical play to engage–the first couple of turns when you’re trying to position your units as effectively as possible are fine, but the entire experience fizzles quickly. A pity it doesn’t seem to convince! The prrmise is rather interesting. But I think it may be harder to put together a strong short game than a strong longer one.